WASHINGTON, D.C. -- Fewer Americans reported that they ate healthily all day "yesterday" in 2013 than did so in any year since 2008. However, the percentage of Americans who reported eating at least five servings of fruits and vegetables four or more days a week held steady in 2013. 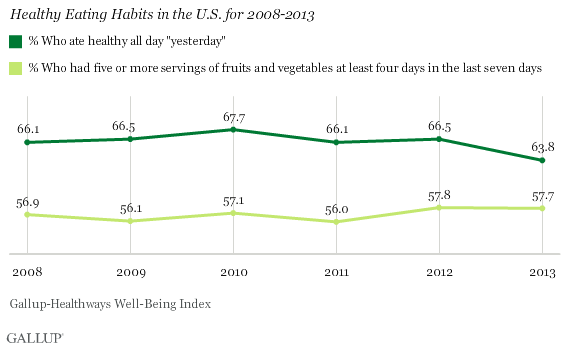 Gallup and Healthways ask at least 500 Americans each day about their eating habits. Specifically, respondents are asked to report on whether they ate healthily all day yesterday and in how many of the last seven days did they "have five or more servings of fruits and vegetables." While these self-reported responses may not be as accurate as observing eating habits in American homes, it does produce valuable year-over-year comparisons of how Americans assess their own eating habits. 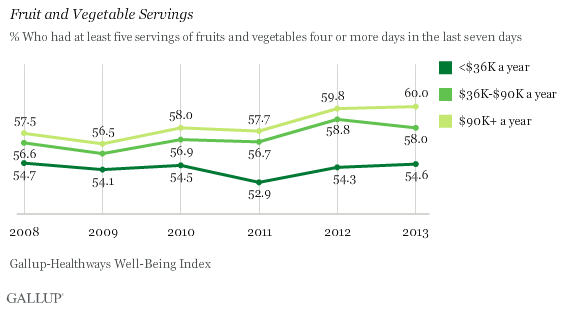 In 2013, 63.8% of Americans reported they ate healthily all day yesterday. This is more than two percentage points lower than reported in any year since Gallup began asking this question in 2008. The previous low was 66.1% in 2008 and 2011. This decline in healthy eating last year is perhaps not surprising given that the U.S. obesity rate rose to a new high of 27.1% in 2013. Food prices in the U.S. increased in 2013 because of major droughts in 2012. These droughts may have led to slightly fewer Americans reporting that they had enough money to buy the food they needed over the past 12 months. 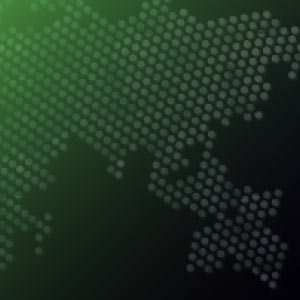 Americans were also slightly less likely to report having easy access to affordable fresh fruits and vegetables in their area, which could also be related to the nationwide droughts. Despite a decrease in the percentage reporting easy to access fresh fruits and vegetables, frequent produce consumption essentially remained unchanged. In 2013, 57.7% reported that there were at least four days in the last week in which they ate the recommended daily amount of fruits and vegetables, which is at least five servings. This is on par with the 57.8% measured in 2012 - which matched the previous high from 2010. Lower-income Americans report eating healthily more frequently than do middle- and upper-income Americans, which is consistent with the pattern seen in prior years. 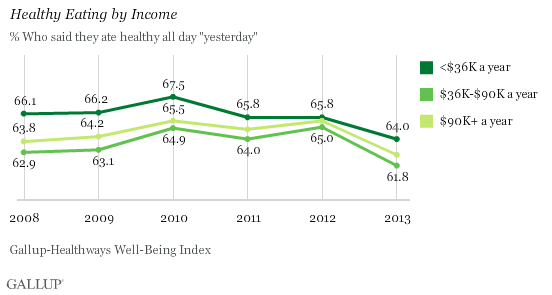 Sixty-four percent of lower-income Americans said they ate healthily all day yesterday in 2013, compared with 61.8% of middle-income Americans and 62.7% of upper-income Americans. The percentage who reported eating healthily all day yesterday declined across all income groups in 2013 to the lowest rate Gallup has measured for each group to date. 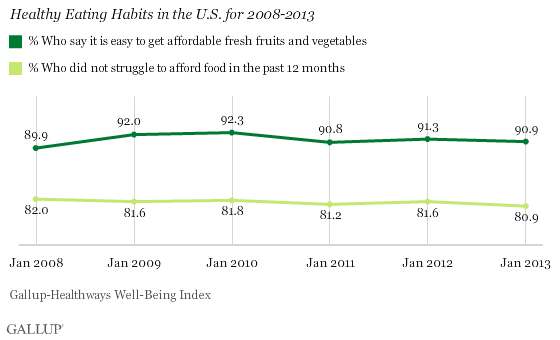 Middle-income Americans had the largest drop in healthy eating, a 3.2 -point decline. Middle-income Americans have continued to report the lowest rates of healthy eating since Gallup and Healthways began tracking in 2008. While lower-income Americans are the most likely to report eating healthily all day yesterday, fewer in that group (54.6%) ate the recommended amount of produce at least four of the last seven days than did upper- (60.0%) and middle-income (58.0%) Americans. Despite a drop in frequent produce consumption among all three income groups in 2009 amid the Great Recession and again in 2011, the percentage of upper-income Americans who report consuming produce frequently ticked up to a five-year high of 60%. But, the percentage of lower-income Americans has not yet exceeded its pre-recession level of 56.6% from 2008. While lower-income Americans are more likely to say they ate healthily than other income groups, they still eat fruits and vegetables less frequently than do Americans with higher incomes. And while the percentage of middle- and upper-income Americans who eat the recommended amount of produce is higher now than it was in 2008, the percentage of lower-income Americans who do is still virtually the same. Further, lower-income Americans are more likely to be obese than upper-income Americans, despite reports that they eat healthier. This disparity between reports of healthy eating and frequent produce consumption may be linked to an information gap, in which low-income Americans believe they are eating healthily, but are not effectively doing so. Upper-income Americans, who are more likely to have higher levels of education, may be more likely to keep up with news about nutrition. The fact that Americans overall ate less healthily in 2013 is especially troubling, particularly as the obesity rate reached a new high. Results are based on telephone interviews conducted as part of the Gallup-Healthways Well-Being Index survey Jan. 2- Dec. 29., 2013, with a random sample of 1,947,144 adults, aged 18 and older, living in all 50 U.S. states and the District of Columbia. For results based on the total sample of national adults, the margin of sampling error is ±0.3 percentage points at the 95% confidence level.